Sometimes it takes years to find your groove, to discover what truly makes you happy each and every day. You think, toil, seek and shift. Some grooves reveal themselves faster than others; providing varying levels of anxiety and unwelcome hiccups along the way. Inevitably, the process to smooth out the hiccups often leads you one step closer to finding your groove. I’m still toiling. As I wrap up my last few weeks of my winter CSA, I’m proud of the range of food, recipes, and knowledge I’ve acquired by simply seeking out this new venture. As the search for my groove continues, I’ve shifted to an even more local approach to foods – growing my own. Having been exposed to Greensgrow, an accomplished urban agriculture initiative breathing new life to an abandoned city corner, articles lauding container gardening for space-challenged city dwellers, and the newest film project from the “King Corn” creators, “Truck Farm,” I’m inspired and hopeful. If the back of a Dodge pick-up truck can cultivate enough produce for a CSA, I can certainly create some semblance of a garden on my windowsill. Or, at least, I can try. On a much larger scale, it seems seeds are garnering a lot of attention these days. Seed manufacturers are consolidating into large corporations, creating less competition and driving up prices impeding family farm business. The scenario of big engulfing the small speaks to the heart of current agricultural tension that is being discussed by the U.S. Justice Department and the USDA in a series of public workshops. To help determine the impact of corporate growth and intrusion in the industry, the workshops are expected to tackle such issues as:  licensing of genetically modified seeds, antibiotic use, pricing strategies, livestock contracts, and the environmental impact of nitrogen and manure runoff. Farmers, producers and advocates are very motivated and anxious to speak their minds. A recent post at Cornucopia details these first conversations in Iowa – only four companies control more than 45 percent of the country’s beef cattle and most pork is processed by just four companies, as well. Corn seed is controlled by two companies and about 40 percent of our milk supply is controlled by one company. One Minnesota farmer stated that since he began farming 34 years ago, seed companies have decreased from 50 to four. The current state of the agriculture industry threatens the one ideal that America prides itself on – diversity. With seed packets that read “Guaranteed to Grow,” I decide to get in on the action (minus the government imposition and advocacy groups). 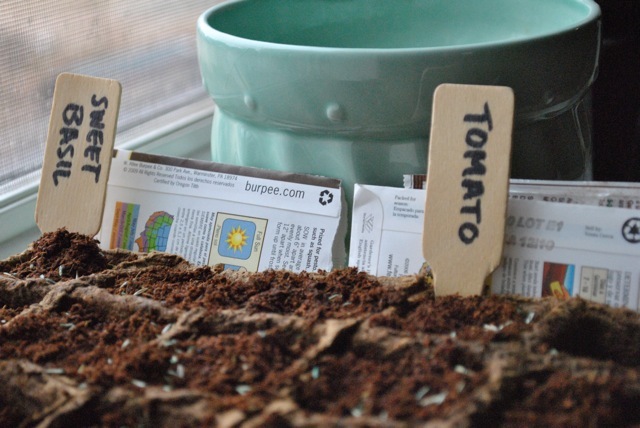 I am starting with tomatoes and basil, diligently following the packet instructions and purchasing what looks like a fail-safe seed starting kit. With any new experience likely comes mistakes; I mistook grass seed for soil and it took a re-visit to Lowe’s to acquire actual potting soil. (The grass seed product’s name is “Smart Seed” – and I thought only the food industry uses confusing marketing techniques!) Embarrassing, yes – but all par for the course for someone looking to find her groove. Let’s hope agriculture in America finds its groove, as well.